TUNGSTEN AND TUNGSTEN ALLOYS - FB TECNO - High Quality steel and special metals. Tungsten, called also Wolfram, is a metal with a grey color whose main properties are high temperature strength, high elastic modulus at low temperatures and a high density. Tungsten, despite its high elastic modulus, is rather brittle and difficult to machine at room temperature; it becomes ductile in the temperature range 200-500 °C. The transition temperature brittle-ductile depends mainly on the purity of the Tungsten and on the thermomechanical deformations. Other consideration to remember in the use at elevate temperatures is its strong reactivity in the presence of oxygen, which limits its elevated temperatures applications only under vacuum or in not oxidizing atmospheres. Tungsten has a thermal expansion similar to that of glasses and it is therefore used as sealing in electronic vacuum tubes of various types. 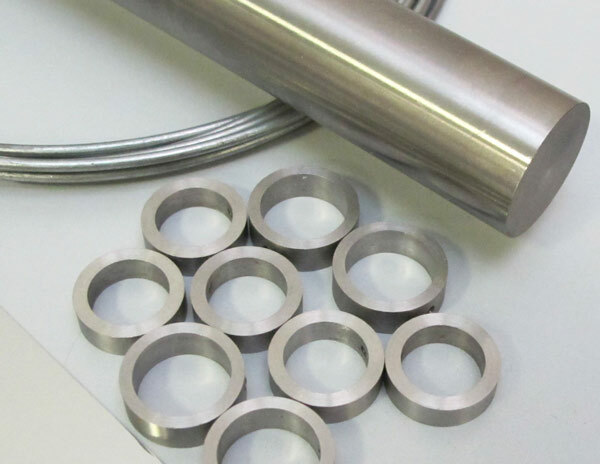 Due to its elevate temperature strength, Tungsten is used to manufacture various components of vacuum furnaces and also heating elements of induction furnaces. For its high atomic number, Tungsten is used in the production of anodes for X-rays equipment in medical diagnostic. Tungsten is widely used also for TIG welding rods and electrodes for plasma cutting. In addition to pure Tungsten, various Tungsten base alloys are available which take advantage of its positive properties while reducing the negative ones making the alloys suitable for various other applications. Tungsten-Silver and Tungsten-Copper alloys combine the strong wear resistance of Tungsten with the excellent electrical conductivity of Silver and Copper making these composites very useful for the production of electrical contacts, electrodes for ETD etc. The Tungsten-Nickel-Copper and Tungsten-Nickel-Iron alloys use the high density of Tungsten for various applications such as balancing elements for rotating parts, counterweights, gyroscope rotors etc. The high shielding capacity of these alloys is used for shielding protection against Gamma-rays and X-rays. Another application that takes advantage of its high erosion resistance in liquid Aluminum, is in dies for the production of Aluminum castings. Special rods of a Tungsten alloy are used as consumables in TIG welding of WNiFe alloy parts/inserts and tool steel casting dies. This application is used to protect the dies against the erosion of the liquid Aluminum. The TIG welding in this application uses D.C. while high frequency current is used only at the beginning of the process. The current density must be 160-180 Ampere. Adequate preheating at around 450°C is recomanded in order to avoid cracking in the HEZ. Multiple and relatively thick passes are also suggested together with a suitable inert gas protection until below red temperature.